This Brisbane family are entertaining on the weekend and didn’t want dirty poolside glass to detract from their stunning Brissy River views, so they called the Get It Clean team to do their window cleaning. When this type of frameless pool glass is clean you should barely notice it’s there. To see your view more clearly call Get It Clean now for a window cleaning glass makeover… and sorry we can’t organise the BBQ! Window Cleaning Hard Water Stains @ Newstead – What Are The Options? Do you know what hard water stains are? They’re fair dinkum water stains! Water stains can appear on any glass where there is a regular stream of water touching the glass or flowing over it. This occurs when the minerals in water slowly deposit themselves on the glass over time and build up to leave stains just like in this picture. Not only does it look unsightly but the longer you leave it the bigger the job it becomes to get rid of it. Normal window washing by professional windows cleaners using an applicator and squeegee will not solve this problem. So how can these marks be cleaned away? 1. Buy a do it yourself product. There are several well-known brands. You apply the paste to the glass. The glass then needs to be polished. This process can be very time consuming and often the results are disappointing. 2.The second option is to contact professional water stain removers. We have recommended the Water Stain Doctor before with good results. One last caution: glass polishing can be expensive so get a few quotes. So if you see any signs of a water stain developing on your building it is best to get a professional cleaner onto it straight away, and regular maintenance can help you avoid the problem altogether. For more advice on those difficult cleaning problems give us a call. Get it Clean has the experience to solve all your cleaning dilemmas. 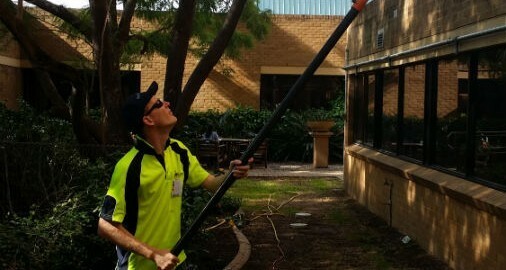 https://getitclean.com.au/wp-content/uploads/2014/06/commercial-window-cleaning-hard-water-stains.jpg 506 900 Get It Clean https://getitclean.com.au/wp-content/uploads/2013/07/get-it-clean-logo.png Get It Clean2014-06-10 07:44:562017-08-15 01:47:28Window Cleaning Hard Water Stains @ Newstead – What Are The Options? Think your mouldy awnings need replacing? Call Get It Clean first and we could save you a lot of money by simply doing a little awning washing for you. If you take a look at the picture you will see how the black mould and mildew has built up on the awning over time. It is usually about this point most owners might think that the awning is too far gone and would need replacing. Had it been left a little longer perhaps that would have been the case. This home owner was savvy though and, as we were there to wash down the exterior of their house and clean the windows anyway, decided to get our opinion on whether cleaning their awning would make any difference. We have special detergents and soft bristled brushes designed especially to clean awnings without damaging them – so we definitely knew we could bring this one back to life. And so once we had completed the house washing and window cleaning at this property in St Lucia, we gave the front facade a facelift by restoring this awning to it’s original stunning white. Some people can’t bear to stand close to windows in a high rise – even when they are safely on the inside of the building. Our Get it Clean team however love the view from the outside as they meticulously clean your building’s windows. Today we are at one of Brisbane’s premier hospitals and our team of expert technical rope access workers are cleaning the windows of this 10 storey high building. This crystal clear Autumn day makes high rise window cleaning conditions just perfect! And by the time we were done, the windows were crystal clear and clean too. Afraid of heights? If so, then you had best let us take care your commercial high rise window cleaning! Today the Get It Clean team was house washing and window cleaning at Bridgeman Downs. Believe it or not, a lot of homes have gaps between panels or windows. These can occur over time as your house expands and contracts (with heat or moisture) … or as soil under the building foundation moves. The answer is of course – yes! We can still safely wash down your home and prevent water entering your house even if there are a few gaps! Before washing your house we check the exterior for where water might be able to enter and temporarily seal it using our “magical” easy peel tape. It does a great job of sealing any gap AND comes off easily without damaging the paint on your home. Fortunately at this Bridgeman Downs house, one of our professionally trained house washers noticed a massive gap the owner wasn’t even aware of between the exterior wall and the sliding door. We take great care to make sure no water gets inside by meticulously taping up just gaps like this (see image). And after we had finished washing the house and removed the gap sealing tape, the owner was thrilled saying she “felt the house looked like it had had a paint job!”. To get your home looking like it’s just had a new paint job in far less time and for far less cost – contact us and give us a call, we’d love to help. The local Daddy Long Legs adopted a ‘not happy Jan’ attitude when we cleaned the windows in this commercial property. Dust and cobwebs had been left undisturbed for several years giving our professional window cleaners a real challenge. In total there were 878 panes of glass … that is a LOT of cobwbes. If you think you might have a tough window cleaning job ahead of you – give us a call, you will be amazed at what we can do. Our Brisbane window cleaners were kept busy at this substantial industrial warehouse in Cresmead today! With semi trailers coming and going all day long and stock constantly moving in and out of the warehouse – there was dirt as far as the eye can see! But where ever there is dirt we can help. Our experienced window cleaners soon had the glass window panes clean again – And there’s now a little more natural light making it’s way into the warehouse. A big welcome to our newest team member, Kris. Kris comes to us with many years of experience with window cleaning and other aspects of commercial cleaning. He looks great on the telescopic poles here cleaning windows on the first storey! Brisbane has got its very own time capsule! Designed by the architect Richard Gailey in 1892, this property had its cornerstone laid by the widow of Patrick Mayne. Under the cornerstone, it is believed, was buried a container with samples of newspapers of the day and the reason for the residence construction. So for a trip back in time and some fascinating historical information on Brisbane visit Moorlands House, Coronation Drive where our team has just finished cleaning the windows. We took the greatest of care to ensure the views from this iconic building were once again clean and clear. It is no wonder these residents are trying to block the sun and its heat with this result! Even though block out curtains are great for blocking light and heat, they can also insulate in Winter by keeping the heat in. They also act to stop outside noise penetrating into your home. As our Get It Clean team found they should not sit directly up against the window pane as the plastic backing can melt onto the glass! Using some of our professional tools, we restored the window to its pristine original condition and our happy client has his view back uninhibited!